One of the killers of toddler James Bulger has been recalled to prison suspected of having child abuse images on his computer. It is the second time Jon Venables has been sent back to jail for the same suspected offence. In a statement, James's mother Denise Fergus said: "Venables has now proved beyond any doubt what a vile, perverted psychopath he has always been." The 35-year-old was recalled last week but has not yet been charged. He was first recalled in 2010, following his release in 2001 after serving eight years for the murder of James, aged two, in 1993. Ms Fergus went on to say: "I predicted Venables would re-offend unless they kept a very tight rein on him and I pray that now, someone from the UK government will finally listen to me." She said "what hurts me most is the way the probation service has tried to cover this up", adding she was only told on Wednesday night that Venables was taken back into custody a week ago. Mrs Fergus said it was "clear that they were trying to keep this quiet, until they got a call from the media". She said she received "a hurried call" from the probation service at 20:40 GMT with "few details given, just that he had breached his terms of the licence and returned to prison", which left her "extremely upset, angry and feeling insulted". She said she would consider making a formal complaint to the probation service. A Ministry of Justice (MoJ) spokeswoman said it takes the duty of updating victims' families "extremely seriously". "A dedicated victim liaison officer contacts families as soon as the offender is charged, but we regret the additional distress this has caused in this case. "We want to reassure Mrs Fergus and Mr Bulger [James's father] that a liaison officer will continue to stay in regular contact with them as the case progresses." On 12 February 1993, James - just a few weeks short of his third birthday - was reported missing by his mother from outside a butcher's shop in the New Strand Shopping Centre in Bootle, Merseyside. CCTV images revealed he had been lured away by Venables and Robert Thompson, both then aged 10. His body was found two days later on a railway line. He had been stripped from the waist down, paint had been thrown in his eyes and he had been beaten to death with bricks and a metal bar. Thompson and Venables were arrested and charged within days. They were both convicted at Preston Crown Court of James's murder, in November 1993. In 2001, the pair were released - with new identities - from secure children's homes on life licence, meaning they can be recalled at any time. What appear to be images of child abuse were found on a computer linked to Jon Venables last week, during a routine visit. He was recalled to prison immediately. The police force investigating him has not been named, as it might reveal where he has been living under a second new identity. 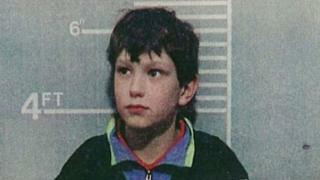 Venables was jailed for life in 1993 for murdering and torturing two-year-old James Bulger. He was first released - on licence - in 2001, but jailed again in 2010 for possession of child abuse images. He was released a second time in 2013, at which point James Bulger's parents said they were "filled with terror". The parole board will now have to decide whether - or when - it is safe to release him again, and will take into account if he appears to be re-offending in a similar vein. Venables was recalled to prison in 2010 after accessing images of child abuse and breaching his parole conditions by visiting Merseyside. He had developed drug and drink problems, started behaving anti-socially and had revealed his real identity to friends. Venables was released again in 2013 with a second new identity.